I don’t have time to visit Trader Joe’s regularly since I can’t get all of my groceries there, so when I do go, it’s a special treat. 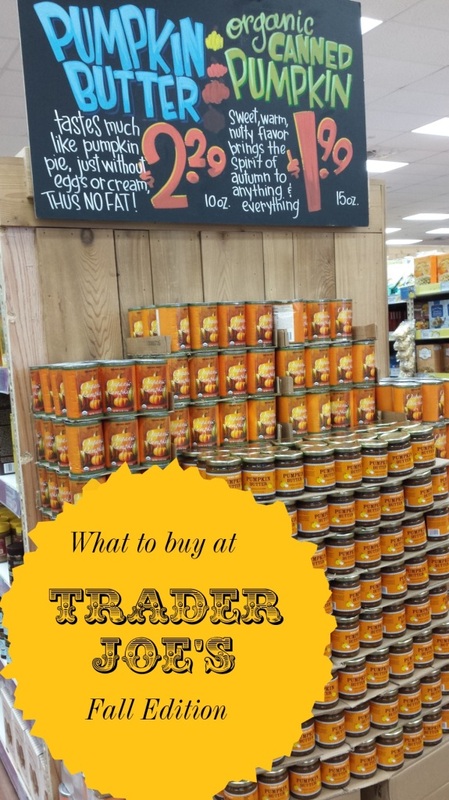 An article I wrote last year about things to buy at Trader Joe’s continues to draw large numbers of readers, so I decided to write about some of the items I found on my recent trip to the store. Here are some things you should buy at Trader Joe’s on your next trip, or at least consider throwing in your cart. I don’t recall ever trying pumpkin butter before, but this stuff is fantastic. Priced at just $2.29, the pumpkin butter contains simple ingredients like pumpkin, honey, sugar, cloves and nutmeg. It smells heavenly and spreads nicely on toasted bread or an English muffin. Each one tablespoon serving contains no fat, 40 calories and 10 grams of carbohydrates. I didn’t buy the canned pumpkin because I have some in my pantry already, which I’m sure cost a lot more than the $1.99 Trader Joe’s charges for theirs. I rarely see a store brand of canned pumpkin, and coupons for the predominant name brand of pumpkin show up only a few times a year, generally close to the holidays. I did not eat any of these, but the person I bought them for said they were quite yummy. I purchased dark chocolate covered pretzels, but Trader Joe’s also has yogurt and milk chocolate covered varieties. I have tried the yogurt covered ones in the past and found them delightfully tasty. 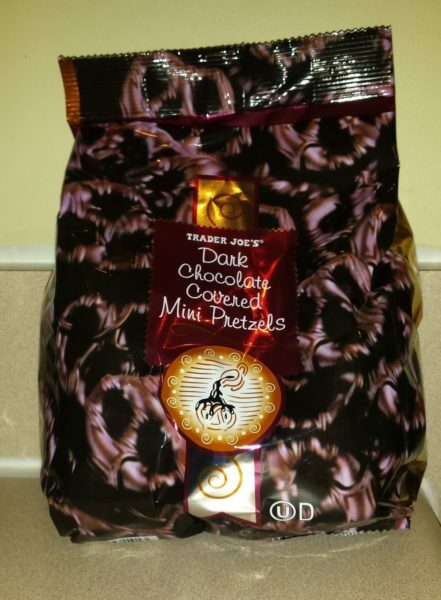 They aren’t really cheap at $3.29 for a 12-ounce bag, but the price is reasonable compared to what other stores would charge for chocolate or yogurt covered pretzels. 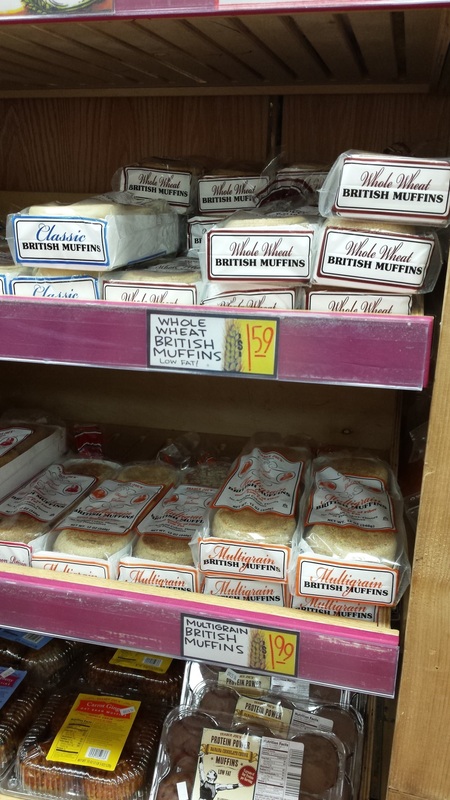 Trader Joe’s calls them British muffins, but whatever name they go by, they’re delicious and cheap (and great pumpkin butter delivery devices). They cost $1.59 for the regular or whole wheat or $1.99 for the multi-grain muffins – cheaper than the usual grocery store prices I’ve seen unless they’re on a BOGO sale. Trader Joe’s had free cider samples in the back that convinced me to take some of this home. My taste testers – ages 4 and 10 – found the cider just as tasty as I did. The samples were warmed, so I heated ours in the microwave at home, too, and less than 24 hours after purchasing the cider, the 64-ounce container is nearly empty, drained by the two kids alone. Its $2.99 price was probably similar to or a bit cheaper than apple cider at other stores. However, cider usually comes in a refrigerated gallon jug, taking a up a huge amount of fridge space, whereas the Trader Joe’s cider comes in a half-gallon, shelf-stable bottle that you don’t need to refrigerate until after you open it. In addition to all the great products, my Trader Joe’s store has a hidden squirrel, which I assume all Trader Joe’s would also have. Kids can find the hidden squirrel to receive a treat from a treasure chest, like a lollipop or small, cheap toy. If you can’t find the furry, gray stuffed squirrel on your own, any of the helpful Trader Joe’s employees milling about the store can give you a hint, such as “he likes java” when the squirrel was hiding near the coffee. Of course, Trader Joes wine and coffee are still some of the chain’s most popular items, including the iconic “three buck Chuck” – Charles Shaw wine costing about $3 a bottle. The store had tons of other interesting products that I didn’t purchase, such as spiced pumpkin seeds and maple cookies, along with a selection of pies and muffins. If you need some unique, fall-themed items for an autumn get-together like a Halloween party or Thanksgiving shindig, head to Trader Joe’s for delicious and reasonably priced options.